ORGANIC YUMMINESS FOR ALL YOUR BABY’S STAGES. This baby food cookbook is the one that does it all. Natural, organic, and irresistible recipes take your baby from infant to toddler and beyond. Ideas for purees, smoothies, finger foods, and meals abound. To top it off, you get nutritious, crave-worthy recipes to satisfy both your little one and your big ones. 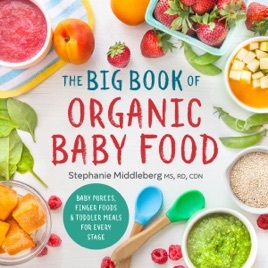 From Sweet Potato Puree to Pumpkin Smoothies to Maple-Glazed Salmon with Roasted Green Beans, The Big Book of Organic Baby Food offers over 230 healthy and wholesome recipes. This baby food cookbook will serve you for years. Ages and Stages—Each chapter covers developmental changes and FAQs to inform your nutritional decisions.Purees, Smoothies, Finger Food—Choose from more than 115 puree recipes and over 40 smoothie and finger food ideas.Family Fare—With 70+ recipes that will please all palates, this baby food cookbook goes way beyond baby food. The Big Book of Organic Baby Food is the only baby food cookbook to feed the growing needs and tastes of your entire family.